The Grand Surrey Canal was started in 1801, with great plans to link fast-developing docks at Rotherhithe with Mitcham and Portsmouth. It opened as far as Camberwell Road in 1811, later reaching Croydon and Peckham, and formed a useful industrial artery for all kinds of goods and materials, finally closing in 1970. Imagine going back 200 years in time… you’d now be floating in the Grand Surrey Canal, one of the boldest canal projects London has ever seen. Engineer Ralph Dodd’s ambitious proposal of 1799 was for a new canal running from the Thames at Rotherhithe south to Deptford, turning west through the park to Kennington, then south to Mitcham in Surrey. Following an Act of Parliament, work began in 1801, and within 50 years the canal was thriving and had made a huge impact on this part of London. The canal allowed industrial cargo to flow through the Surrey Commercial Docks (today’s Surrey Quays) into the area. Industry sprang up to take advantage of the cheap transport, and rows of terraced housing, pubs, schools, a library, a bathhouse and shops were built to support the booming population. However, by the 1930s motor traffic had overtaken the canals. By the 1960s, as the Surrey Docks declined, the canal lapsed into polluted neglect, resulting in several child-drowning accidents. In 1960, this ‘killer canal’ was drained and filled to the west of Wells Way, and there were few objections when the eastern section and the Peckham branch followed suit in the early 1970s. You can read an excellent, much fuller history of the canal on Wikipedia. Listen to people’s memories of the final days of the canal here. Today the line where the canal used to run is the central walkway through Burgess Park. Follow this line from Camberwell, through the underpass, beneath the ‘Bridge to Nowhere’, to Glengall Gardens, once a canal basin allowing barges to turn to and from Peckham. Somewhat surprisingly, that main traffic on the canal was made up of large sailing barges, rather than the usual canal ‘Narrowboat’. 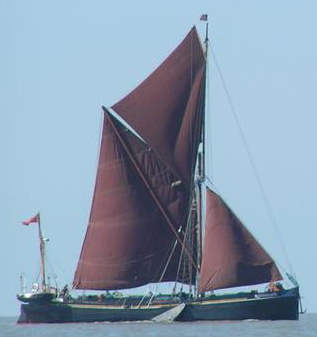 The Thames sailing barge was a type of commercial sailing boat common on the River Thames and the Thames Estuary in the 19th and early 20th century. The barge’s hull was originally made of wood, later steel, and was around 90 feet (30m) long and 20 feet (6m) wide. Most of the hull was a hold for cargo, with two small living areas in the bow and stern (front and back). As the hull was flat-bottomed, the barges could float in as little as 3 feet (1m) of water, making them ideal for work in canals. In fact, they could navigate small rivers and creeks around the coast of Britain, the open sea, the river Thames and then the Surrey Canal, allowing goods to make the complete journey without being transhipped. The barges had two masts with four sails, which were often rusty red in colour because of the red ochre and cod oil which was used to keep them waterproof. The masts were taken down when barges had to travel under the low bridges on the way to Camberwell and Peckham. In later years some barges were also fitted with engines. In good conditions, sailing barges could attain speeds over 12 knots (13 miles an hour). Cargoes varied enormously: bricks, mud, hay, bibles, lemonade, ice, sand, coal and rubbish, for example. A two-person crew was enough for most voyages, though they would have to work very hard. The barges’ heyday came around 1900 when over 2000 were registered, but by 1970 they had disappeared from the river and canal. Why is there a bridge to nowhere? The Friends of Burgess Park invited resident Art in the Park artists to work with local young people aged between 7-14 years old to find the answer. Exploring the park with a historical map, the children were able to discover the lost Grand Surrey Canal. 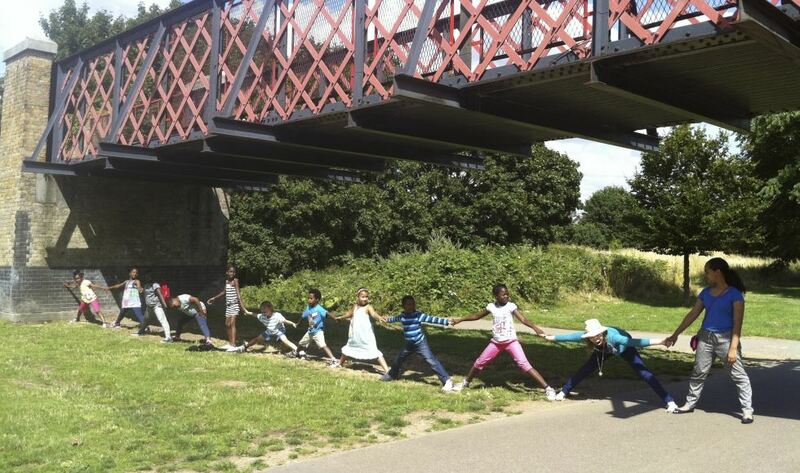 They stretched arms across the bridge and concluded that it took 30 children to equal the width of the canal. Using imagination and role-play they became a working barge (or was it a pirate ship?) with others pulling cargo down the canal. They realized that, while being a child back then was hard work fraught with danger, it also seemed very exciting! They imagined where local industries would have been and discovered that one was a lemonade factory – which brought Charlie and the Chocolate factory to mind. A tasting session was required to see if R. Whites is the fizziest lemonade! Walking to the Lime Kiln some thought they saw a castle, but with research they learned how the kiln made lime to help build houses. Though hot and difficult, some thought it would have been a great job for keeping warm in winter. Children looked at the vivid blues of the Camberwell Beauty butterfly, and imagined how they could incorporate these colours into their own work. 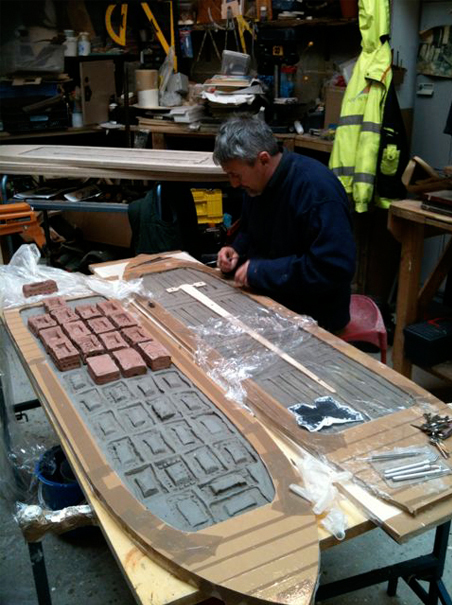 The children then worked in drawing, painting, wood carving, plaster casting and brick making, recreating the factories’ smoky chimneys, barges and the flowing water of the canal itself. These art processes can now be seen at the underpass in Burgess Park and is their reinterpretation of the barges and the materials they once transported back and forth along the canal such as bricks, lemonade bottles, shells, timber and printed books. Read about the opening of the artwork in our blogpost. It’s great to see an article on the Surrey Canal and that the remains are being put to good use. Also I was glad that the local children could be made aware of what used to pass near to where they lived. I loved the list of their names, they were so unusual and I couldn’t have even dreamt them up, they showed that every one was a different individual and should be looked upon so. I used to live in North London and sometimes ventured to South London and saw the demise of the Grand Surrey Canal and often wondered what use it had been put to. I’m glad that it is being put to educating children and get them use their imaginations.